Tonight on CBS Hawaii Five-0 continues with an all new Friday October 24, season 5 episode 5 called, “Ho’oilina.” On tonight’s episode McGarrett [Alex O’Loughlin] meets a woman who helps him reopen his father’s last cold case. On the last episode, when a Detroit hit man was taken out by one of his colleagues on the streets of Oahu, Five-0 was shocked to learn the killer’s surprising motives. Meanwhile, Chin put his career on the line to help Danny get the money he needed to save his bother’s life. Did you watch the last episode? If you missed it, we have a full and detailed recap right here for you. On tonight’s episode on the fourth anniversary of his father’s death, McGarrett meets a woman who helps him reopen the last unsolved case his father worked on before his death. 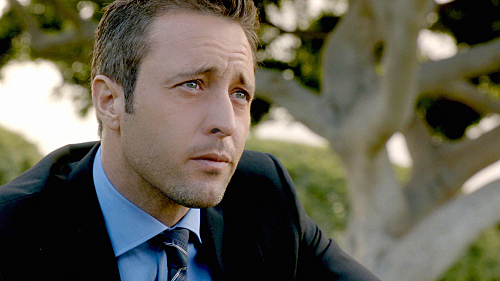 It’s time for #H50. We see Steve dressing in a suit and tie and sighing. He heads out but looks morose driving his truck. At a cemetery, he looks down on the grave of John McGarrett, his dad. He tells his dad that he talked to Aunt Deb and says she’s going to try chemo because they’re fighters. He tells him Mary is good and is a strong woman and great mom. He says she sends him videos so he can see Joanie grow up and she’s taking her first steps. He says he wishes his dad was here for all this. He kisses a coin and leaves it on the headstone. He says he misses him. He goes to leave and calls Mary. He says he’s at the cemetery but wanted to check on them. He says it’s crazy that it’s been four years. He notices a woman at his dad’s grave and pulls off his glasses. He sees her talking to the headstone as well and tells Mary he has to call her back. He goes after the woman and asks if she knew his dad. She asks if he’s his son and says he has his eyes. She introduces herself as Ellie Clayton. He asks how she knew his dad and she asks him to go for coffee. Ellie tells him her dad owned a bar that was robbed and her dad killed. She says his dad worked the case and never found the killer but always checked in on her and took her to lunch each year on the day he died. She says he always made a difficult day easier. She says so now she honors his dad’s memory on the day he died. She says they spoke shortly before he died to tell her he had a new lead on her dad’s case but didn’t say what it was. She says he never gave up on the case. Ellie says she has to be in court – she’s a lawyer. She’s a deputy prosecutor and hands him her card. She says his dad was proud of him and talked a lot about him. He asks the name of her dad’s bar and she says Aces High. He seems struck by something but says he just remembers it and doesn’t say more. They shake hands and go their separate ways. He goes home and gets into his tool shed and pulls out from a tool box a book of matches from that bar. Jerry is packing and Kamekona, Chin, Mindy and Max are there helping but aren’t thrilled with his hoarding ways. Mindy asks if he’s been diagnosed as a hoarder and he says he’s hoarding the truth then asks if she’s been diagnosed a necrophiliac for hanging out with corpses all day. She tells him denial is another symptom. He leaves to go pack the kitchen. Chin gets impatient with the process and goes upstairs and asks what Max is doing. He takes his headphones and sees he’s eavesdropping on the book shop. Chin says this is a felony for bugging. Jerry says Ferrell could crash the economy and Chin says the Secret Service cleared him. Chin tells him this is enough and says Steve already told him to back off twice. He asks how he bugged him and Jerry says it’s a Trojan horse. He sold him a rare book with a bug in it. Chin says to get the book back and shut it down. Steve shows up and he begs him not to tell him. Steve says he’s there for Chin, not to pack and they head outside. He asks if his dad ever talked about a cold case involving Clayton. Chin says the case haunted him and shows him the pack of matches and tells him about Ellie. Chin says there was a string of robberies nearby and the thief shot him in cold blood. He asks about suspects and Chin says a homeless Ned Burroughs was found wearing a sweatshirt with GSR on it. He says he found it in a dumpster. He tells him that John figured out Burroughs knew more than he was saying but couldn’t find the guy. He tells him that his dad called Ellie to tell her head a clue. Steve wants to re-open the case and asks for Chin’s help. 19 years ago, we see a young Ellie doing homework at the bar and her dad telling her that her mom would have been proud of her grades. He tells her to take a break and turns on the juke box. He grabs her up to dance with him. We see a guy lurking outside watching them dance to My Girl. Her dad sends her up to bed and tells her he’ll be up soon. The guy creeps up to the back door of the bar and breaks in. Her dad hears a noise and goes to check on her. He’s shot, she hears the noise and sees a guy in a hoodie running away. She tells Steve about that night and says her dad was nearly dead when she got there and that she begged him not to leave her. We see her crying and John introducing himself to her. He says he has to ask her some questions. He sits down by the young Ellie and tells her she’s going to make it through this although it won’t be easy. He tells her he has a daughter her age and that he tells her she needs to be strong when things get tough. He says if she can do that, she’ll be okay. He hugs her while she cries. Ellie asks if he figured out about the lead his dad mentioned and he says he might but it may be nothing. She says she’s learned as a prosecutor that even promising leads don’t always pan out. She thanks him for looking into it. Lou tells Steve they found no shell casing so it was likely a revolver. Steve asks to have the fragments tested. He takes a call from Chin who says his dad tracked down Burroughs through a homeless ID program. Chin says they can track him down now. He finds Burroughs who says he fished out more than just the sweatshirt. He says he also found a watch and the cash box with the money still in it. He says he figured the guy was going to come back for the cash. He says he spent the money partying and for drug use but hid the box in an old abandoned building. He takes them to it and there is an odd card, a few bucks left, the watch and a report card. Steve says this doesn’t add up and says the neighborhood was a ghost town and there were no cops so he didn’t need to stash the box. Steve says the killer took the cash to make them think it was a robbery. Chin says Paul Clayton’s murder was pre-meditated and Steve takes it a step further and says it was a hit. Ellie comes in to talk to Steve and he shows her the report card they found and says he followed up on the lead and don’t think his death was a simple robbery. He asks her to think back about anything unusual the days before the robbery. She says a week before the murder, her dad was arguing with a guy named Jordan Lewis who was 15 or 16. She says it was a bad argument but her dad wouldn’t tell her what it was. At the prison, Chin and Steve pull Jordan out of his cell to speak to them. Steve asks him about Paul. Jordan says he remembers him and him dying in a robbery. Chin says they think it wasn’t a robbery. Steve asks about the argument he had with Paul. Jordan says he’s off base and says Paul was trying to help him get out of selling drugs and even offered him a job. He says he wasn’t dealing because he wanted to. He says his mom was a junkie and in debt to a local dealer named Sykes and he was working off what she owed. He says Paul didn’t get it and thought there was another way. Jordan says that’s what they were arguing about – he says the man was trying to save his life. Jordan says if he doesn’t believe him to check his medical records. He shows them a scar on his leg and says he had a surfing accident and was getting stitched up the night of the murder. Steve says they’ll check it out. Jordan says he hopes they catch the killer. Chin says ballistics didn’t turn up anything neither did re-running fingerprints. Chin remembers 15 years ago when John took a Christmas gift to Ellie while he waited in their squad car. Chin told John he’s lucky she’s looking out for him and he says she’s a kid who needs people. Chin asks if he’s talked to Steve lately and he says it’s been a while. Chin tells him his dad’s biggest regret was sending him and Mary away after their mom was killed. Lou calls them out and Kona says the card with the weird symbol is to an underground card parlor. Dominic Alonzo ran it but he’s been dead. They wonder if Paul owed money he couldn’t pay since the organization was known to be rough. Ellie is in her dad’s old bar which is shut down now. She touches the spot where she sat doing her homework nightly. Steve shows up and says her office told him she left early. She said she could never bring herself to sell the place even when she needed money. He shows her a pic of the mystery card and asks if she knows what it is. He tells her they found it in the cash box and says it gave her dad access to an underground game room. Steve says his murder may have been illegal gambling related. She says her dad used to gamble a lot. She says in his 20s that’s how he scraped the cash to buy the bar but says he stopped before she was born. Steve says he also wants to exhume the body and have a second autopsy. She asks why and he says if they can get some more of the bullet fragments, they may have better look with ballistics. Steve says he knows this must be hard but she agrees and says she wants to catch her dad’s killer. Steve holds Ellie’s hand at the cemetery while the grave is exhumed. Flippa and Jerry rehearse the plan outside of the bookstore. He says he’s got it and Jerry waits while he goes in wearing a wire. He greets Ferrell and says his cousin sold him a copy of a first edition and says he needs it back. He says the book has been in his family for generations and says his cousin sold it to support his drug habit. Ferrell says he already sold the book. Kamekona tells Kono and Lou that he showed Paul’s pic to some people he knows that worked at the gambling den. They told him he showed up just once and says he argued with some card players that were serious trouble – they were SVL – a Samoan street gang. Lou wonders if he somehow hustled the DVL guys. Max and Mindy do another autopsy of Paul’s body. Kona says they matched the bullet and it was used in another case – the suspect was Tony Malua, a former SVL member and who hung out at the gaming den. They go roust him at his home and show him Paul’s photo. He calls Paul a haole and says he didn’t touch him. Tony says he didn’t do it and they tell him they know it was his gun. He says Sykes shot the guy and says they were arguing over a corner boy. Tony says the haole came in and offered to play cards for the kid’s freedom and Paul won in cards and humiliated Sykes. He says Sykes couldn’t let it go. Kona says Jimmy now owns a club in Chinatown and was a former ice pusher. They go back to see Jordan at the prison and ask for his help to catch Paul’s killer. They pull him out of jail and send him to see Sykes. He’s brought back to his office and Sykes welcomes him warmly and asks when he got out. He says he got out a couple of days ago and is looking for a job. Sykes asks why he’d do that and Jordan says he owes him. Sykes says he trusted him as a kid because he owned his mom. Jordan says he’ll take anything and Sykes says he has no skills since he’s spent half his life in jail. Jordan tells him he owes him for keeping his mouth shut all these years about Paul Clayton – the guy he killed for no reason. He says he knew about him all along. Sykes says the guy was messing with his business and he did what he had to do. Sykes says he’s the reason Paul is dead – he says he got him killed. Jordan smacks Sykes in the head with a bottle and tells him Paul was the only person that ever gave a damn about him. He pulls off the wire and rants. Sykes sees the cops coming in and shoots Jordan. Steve busts in and Sykes aims for him but he shoots Sykes first. They load Jordan into an ambulance and he tells the cops he’s sorry – says he couldn’t help himself. Steve is in his garage and puts the matches back in his dad’s tool box and locks it back up. He hangs his head then remembers his dad asking him for tools when he worked on his car. He thinks about his dad showing him how to work on it and complimenting him for a job well done. He smiles at his dad’s car, still in the garage and later pulls it out to work on it. Ellie shows up then and asks if he needs a hand. She says she was on the way to the hospital to see Jordan but wanted to thank him first. She asks if it’s the differential and he says he is. She tells him new bearings and thrust washers and he’s impressed. She says she knows about that particular car and says his dad always talked about the car. He asks if she can fix the intake manifold leak but she has no clue. He says he’ll figure it out one day. She smiles and says she has to go. He asks if he’ll see her at the cemetery next year and she says yes, but she hopes it’s not that long before they see each other. He says him too and watches her go. Ferrell is lurking in Jerry’s basement. He says he’s there to return his book and says there’s a passage about meddling in others affairs. He says he who does faces retribution. Someone is behind Jerry and puts a bag over his head. That’s it! OMG!